Billy’s is a retro nineteen fifties-esque diner that has it going on. You sit shoulder-to-shoulder on the old fashion soda counter stools and watch the show. The men who work the griddle are southern vagabond, recent college graduates, with more humor than anyone knows what to do with who can flip a mean burger. These astute grill practioners are masters of the meat and doctors of the waffle fries. You are background to the lives of men who make the biggest and juiciest half-pounder that is ever so lovingly placed on a bun with iceberg lettuce and tomato. Dr. Uncanny Canadian and Ms. Uncanny American (aka Adorable Girlfriend) shared a perfect burger on both visits. And there was no shame in that. The abundant burger was split in half where both parties were served fries in their own basket and all for the price of less than $7.00. I challenge you to find a bargain like that elsewhere. Now that’s good stuff, fellow fans. There is no shortage of quaint drama in this unassuming diner. There are handwritten rules posted on the wall. Now normally the Uncanny One is OK with rules and Ms. American Liberal is pitching a fit. Yet, diplomatic relations were achieved on these policies. For instance, lucky #30: no cell phone use at the counter. And the pretty persuasion of the female form that dared to use her cell phone got heckled by the grill masters and the other counter customers until she finally acquiesced. As did the woman who tried to order her burger rare. That would be rule #19. While the food is flawless on its own and hardly needs accompaniment at all, it is really all about the classic rock in the speakers that serenades you. And it’s not just some Led Zeppelin or Doors saturating the diner, it is also a platform from which the grill masters quiz you. You need to bone up on your greatest guitar player ever, be able to name all four Doors members and know what year any specific Who song was written before you dine. However, do not fret if you do not know, it is likely neither does the guy next to you. 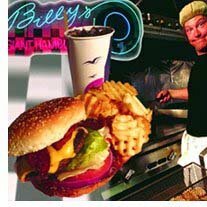 It is just all part of the experience that makes Billy’s, well Billy’s. Ms. American informed Canadian that she would leave him for Billy at any moment upon exiting the second experience of the closest thing a Jewish girl can coin, “heaven”. Bostonians sometimes forget that the realm of New England clam chowder can extend outside of the hub. For an authentic meal in a no frills, no messin’-around locale, head to Gilbert’s Chowder House in Portland, ME. Belly up to the Formica countertop to be waited on by a local. 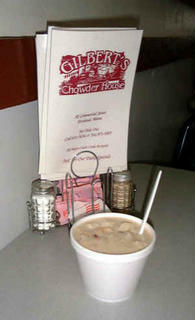 There is a myriad of chowders to sample ranging from the infamous clam to seafood to fish chowder. It’s not all chowder power. You can sample a delectable lobster roll on bread that tastes like it has been marinating in butter since last summer or a crab roll that melts in your mouth not in your hands. You know: a local crab died for your dining pleasure, but let’s face it folks – that’s what keeps everyone coming back for more. And if you have your eyes on the prize, you can sample an authentic perfectly steamed Maine lobster to go with the vat of drawn butter that the wait staff brings with a smile. Commercial Street in Portland welcomes customers to this reasonably priced charming little diamond in the rough. BEHOLD! 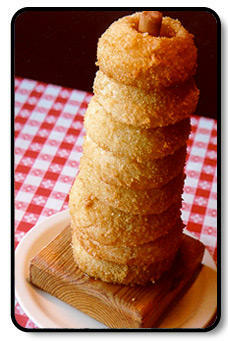 The leaning tower of oniony wiener! Bow down! BOW DOWN! PS. 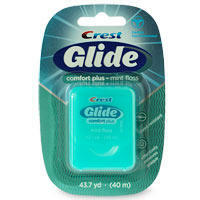 I wanna marry Glide floss. The Miami Subs chain is controversial. Some say "they're gross". Some say their South Florida pastels "hurt the eye". What does Three Bulls! say about the Miami Subs Super Burger? At first we were wary of getting a burger at a supposed sub joint. But our fears were dismissed as we saw them put that 5 oz fatty patty through the conveyor belt oven. Basically what was generated was a flame-broiled fast food burger that tasted like that, not like they sprayed on "grill flavor" (I'm looking at you, self proclaimed Burger Monarch). What comes on it? Lettuce, tomato, onion and mayo on the perfect soft, flour-topped bun. Those are our fave burger toppings. Three Bulls, in another controversial move, loves mayo on burgers. This was actually an awesome burger for what it was. I realize some of you snobs out there would think otherwise. Too bad. PS, we just found out why: a Miami Subs Deluxe burger has 59g of fat and has over 750 calories. That is not a lean burger. That's getting into the monster thickburger category, except these don't taste like a soggy sponge.